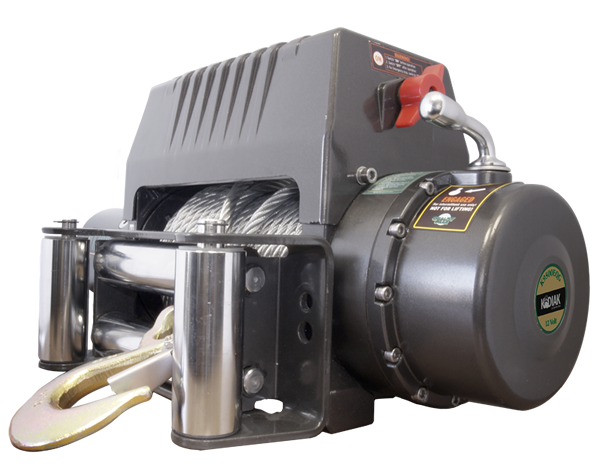 The Kodiak Bruin (K9500EQG) is a great electric winch for mid size off-road vehicles, jeeps in paticular. The Bruin 9500 is just what any outdoor enthusiast needs for getting out of a muddy situation. It has an easy-to-use remote with a 15 foot cable, a galvanized cable hook, colour coded power cables, a 100 foot winch line, and comes with the "Bear Essentials Kit". The Bruin 9500 has a maximum line pull of 9500lbs and is more than capable of getting your mid sized off-road vehicle out of the mud and back on the trail.